Choosing a school for your child is not an easy decision. If you are looking for a place where your child will experience a solid academic foundation in a caring, family-centered, Christian culture, look to IHM. With more than 200 students from diverse backgrounds, in preschool through 8th grade, we are committed to partnering with parents to help each child develop spiritually, academically and socially to meet the challenges of our world. We offer excellent academic programs and cutting edge technology, while integrating dignity, mutual respect, cooperation, prayer and service into each area of our students’ daily lives. To ensure our students are prepared for high school, college and beyond, IHM offers a challenging curriculum, accommodations for different learning styles, dedicated and highly qualified teachers and a strong community base that studies, plays, prays and socializes together. We are a diverse family that welcomes all and is dedicated to helping each other grow in virtue, faith and knowledge. Every family here is committed to their children’s education. We hope you will join us to make this school even more remarkable. IHM School challenges students to discover God’s gifts spiritually, intellectually, socially and physically within a community that nurtures, honors and respects the unique person. IHM students are well prepared for a college-bound high school environment. 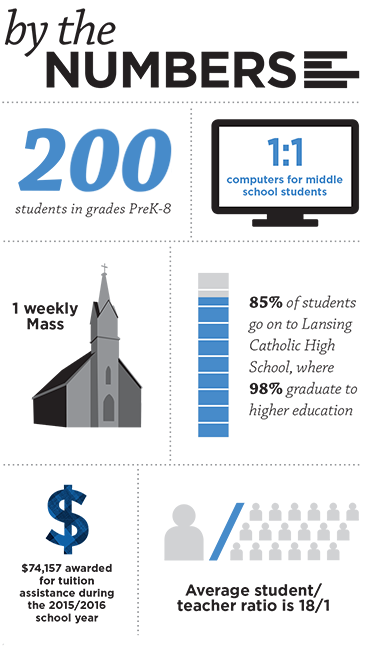 We have the largest percentage of students in the Lansing area who go on to Lansing Catholic High School, where 98 percent graduate and go to college or a university. 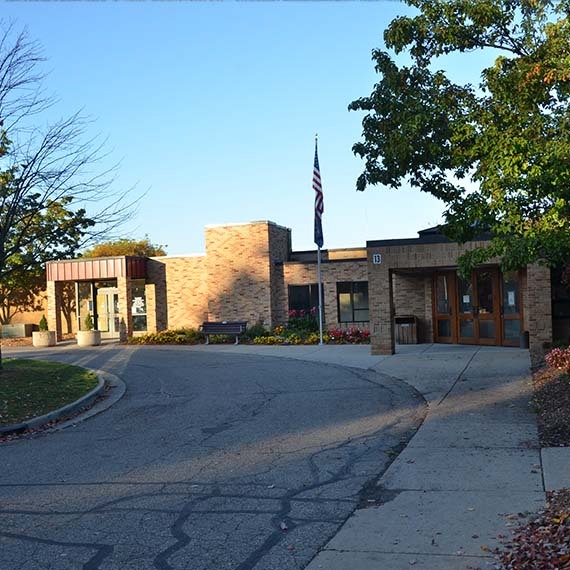 Accredited by the Michigan Association of Non-Public Schools, we offer a core curriculum of language arts, mathematics, science and social studies, along with art, digital art, band, computers, drama, music, physical education and Spanish. Brain Boosters is also offered in the middle school. Each of these subjects is taught by our dedicated, caring and professional teachers with strong academic credentials. We also offer a five-star Great Start Preschool program. IHM strives to serve every child by taking into account their individual gifts and needs. Our faith is built into everything we do at IHM School. We are proud of our Catholic identity and provide a strong faith foundation through Catholic religious instruction, weekly Mass, daily prayer and an emphasis on virtues. All faiths are welcome. We strive to transform children’s hearts and minds through practicing virtues and celebrating the joy of Christ in every subject. Additionally, all students are expected to participate in service projects, which vary by grade and season. IHM School offers a wide range of activities to help enrich our students’ lives. Our close partnership with parents enables us to provide engaging activities such as Scouts, choir, Spirit Week and Red Ribbon Week, a walk-a-thon, family activity/dance nights, middle school activity after noons and more. In addition, we offer childcare and before - and after-school care. We also offer fun, safe and enjoyable youth sports that teach our students skills, respect and good sportsmanship. Sports teams include boys and girls basketball, volleyball, baseball, softball, cross country and track.